Originally, I meant only to add a description of intelligence for character creation; and then I had a bit of clarity before falling asleep last night. I picked it up this morning and had meant to carry it forward up to 18 intelligence ... but alas, I lost the thread of my intent long before. The idea follows something I proposed long, long ago, saying I would need time to think about it. Having got it this far, I probably need time again; or perhaps I've just lost my clarity in the midst of researching and trying to build a fluidity to the change of each intelligence value. Here's what I have, transferred from my wiki. Variously defined to include logic, understanding, self-awareness and reasoning, for game purposes I have chosen to describe intelligence as problem solving ability and alertness. In game terms this argues that seeing the answer to a problem is a question of intelligence, not wisdom; and that being aware of what is going on around the individual is also intelligence, and not dexterity. Intelligence as described here bears no similarity to "I.Q." 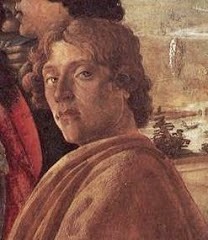 Ability checks are made against intelligence only when there is doubt that the character's intelligence is sufficient to reason through a set of variables or be alert enough to see the meaning of a given clue or detail. 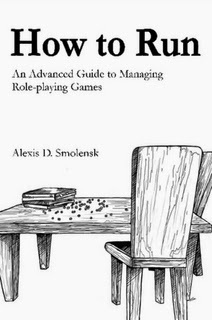 Players cannot simply turn to the PC's intelligence as an ability that lets them roll and instantly "know" things. 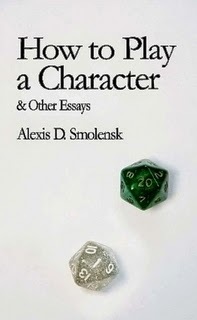 Players must use their own intelligence 99% of the time throughout the game; however, very often the player will attempt an action or a plan that the character would be unlikely to conceive. In that instance, the player should make an intelligence check. If successful, the action can be carried out. Take note; "learning ability" is often attributed to intelligence; in my game, that would be part of wisdom. Intelligence is an important characteristic of mages and illusionists, and a minor requisite for assassins, bards, paladins, rangers and thieves. For mages, intelligence will dictate the maximum number of spells that can exist in the character's spellbook (qv). Furthermore, it should be understood that upper spell levels for mages cannot be employed at all if the mage has a minimal intelligence. 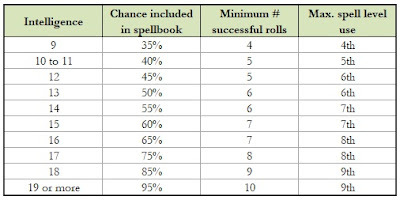 Chance for a spell included in the spellbook describes the percentage chance that is rolled for each spell in the magic user lists to determine if that spell is included in the mage's conceptual ability. This does not apply to illusionists. 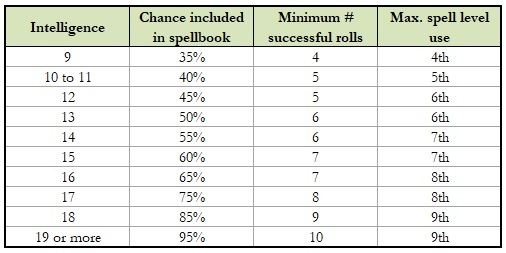 Minimum # of successful rolls indicates the lowest number of successful rolls for spells that the mage can have. This does not apply to illusionists. Maximum Spell level use shows the highest level of spell that the character can use with that intelligence. This column applies to both illusionists and mages. Unable to think and lacking self-awareness, these creatures act without will, driven by hormonal responses. They are compelled to find food or to reproduce. Once engaged in combat they will not retreat but will always fight to the death. They cannot communicate with others of their own kind except through the release of pheromones, which may appear to create cooperation but in fact is purely reflexive in response. Sufficient to provide minimal self-awareness and bare instinct resulting in an innate behavior in response to outside stimuli. Creatures of deficient intelligence will experience fear and will herd together for defense ~ but will equally abandon others of their own kind, including their offspring, with self-preservation being more important than social bonds. Reproduction if primarily sexual, with times of the year when instinctive competition to determine opportunities to mate takes place. Displays feature activities such as showing plumage or rutting. These creatures are always herbivorous and never hunters; they will exhibit some curiosity towards the offer of foods, especially those of a pleasant odor. Without magical influence, these creatures defy interaction and cannot be trained. Necessary for domestication as a creature. Take note that not all domestic creatures have an intelligence of this value; only that they must have at least this much in order to form an attachment to a more intelligent companion. Creatures of domestic intelligence will also show a fondness and loyalty. They can be angered and will become defensive if angered; they will not always fight, however. This defensiveness is often a show of threat before fleeing. Creatures of this intelligence will form family relationships for life, care for their offspring, defend their lairs, display memory, play, act curiously if not threatened and will actively hunt (including tracking and returning to familiar hunting grounds). These creatures will also cooperate with their own kind, though often they will become aggressive and competitive once food is available. Primary motivations continue to be the pursuit of food and reproduction. Necessary for humanoid creatures (with much lower-than-average mental acuity) and commonly the intelligence for successful hunters such as canines, felines, suidae, ursae and a wide range of magical beasts. These creatures will hunt patiently and cleverly, will share food among their clans and will care for and adopt the young of others. They will form close domestic bonds with more intelligent creatures, particularly with tool-making humanoids. They have strong memories, will form lasting bonds and cooperative relationships with humanoids (hunting and sheep dogs, cormorants, working animals, mounts, etcetera), are strongly faithful, will play and will defend creatures other than those of their own kind. They are able to recognize treachery and also display a wide range of emotions. Humanoids will be minimally communicative and animal-like in their display of emotions. They will form staunch bonds with others and will sacrifice themselves rather than let those others come to harm (though the sacrifice is not self-aware; death is a difficult concept to grasp). Fighting abilities will be instinctive; they are limited to bashing weapons. Weapons may not be hurled, not because the creature is physically incapable, but because it doesn't not occur. They are limited to daily living skills and are limited in sage abilities to adaptive or instinctive abilities [no defacto list exists at this time]. All efforts to problem solve or be alert, as well as recovering anything from memory, requires an intelligence check. Enables self-awareness so that the creature is aware of their own awareness, and in humanoids the ability to express consciousness of their own mental limitations. Creatures are able to comprehend money, the importance of some things over others and reasons why they are being asked to do things. Creatures of this intelligence include a wide variety of non-social monsters, many of them with inborn skills, primates and humanoids who represent lower-than-average mental acuity. No humanoid race comprises principally of members that are of this level of intelligence. Creatures, both humanoid and not, will betray deviousness, be capable of lying, yet will remain naive of consequences for their actions. Play is often extraordinarily aggressive or excessively idle, such as repeatedly throwing a ball against a wall for many hours at a time, mesmerized by the patterns it forms. Memories are long and grudges are common. They are not likely to judge the actions of others except when those actions directly infringe on their freedom. Humanoids will be haltingly but moderately communicative and expressive with their emotions. They will form highly loyal bonds with fellows and may even fall in love, though they will not understand the social mores associated with relationships. They are not able to rebel against requests from trusted companions without an intelligence check. When a check succeeds, being conscious of their own limitations, they will be enormously proud of themselves. Fighting abilities are instinctive; bashing and stabbing weapons are permissible. Weapons may be hurled. They are able to do tasks made of two-or-three steps, such as sharpening a weapon AND putting it away or eating from a plate, washing that plate and putting it away. Such things are limited to busywork; tasks that require figuring the place for something unfamiliar, sorting, locating something that can't be seen or is in an unfamiliar place, or any more complex problem requires a check. The creature can watch and be trusted to be aware in that specific direction, but being alert for something unexpected requires a check. Sage abilities must still fit into the descriptions above or are not available to the creature. Minimum necessary for a humanoid culture. Creatures are able to perform all familiar tasks related to food gathering, hunting, raising offspring, sorting and sharing material wealth and rough hand-made tools without checks, but do not have interpretive-based sage abilities. Though able to understand the spoken word generally, creatures have high difficulty understanding abstract concepts such as philosophy, mathematics, science, mechanics or distant geography. Religion and history is understood primarily through story-telling and art, with no real sense of theology or causality. Magic is appreciated and recognized, but the process bears no comprehension at all. Limitations on such things, or why there should be limitations, are unclear to the creature. When in simple, day-to-day situations, it is rare that any checks will need to be made. 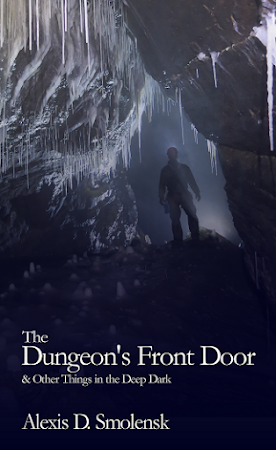 However, the alertness needed to think a player character's way through unusual environments (dungeons, dangerous and chaotic terrains, cities or streets where sensory overload is constant) will require occasional checks if there is no one else to keep the character focused. One such situation is battle. Should surprise occur, creatures of primitive intelligence are apt not to rely upon their instincts but upon their responsibilities ~ and this may cause the creature to freeze, similar in manner to a deer but for entirely different reasons. Because of this, unless an intelligence check is made, the creature will be unable to take any action except to defend themselves for one more round than is usual. This hesistancy can be overcome, however, if a more intelligent creature, unaffected by this hesitancy, is there to shout "attack!" or similar order at the right moment, spurring lesser companions to action. Thus a chief in a primitive clan or tribe will usually have sufficient intelligence to thus lead their people. 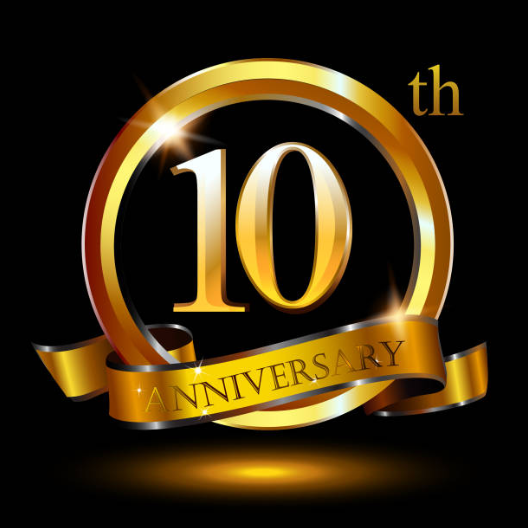 Primitive intelligence allows the use of most hand-to-hand and hurled weapons, but discounts use of the bola, the bow, slings and like weapons that have multiple or moving parts. Common implements with moving parts require a check to use; complex implements, such an astrolabe or abacus, are beyond the creature's ken. Though in the upper group for primitive cultures, for most civilized societies this indicates the bottom range of competent intelligence for social participants in daily life. Such creatures are able to work at repetitive tasks, raising food, maintaining domestic animals and other day-to-day social duties without intelligence checks. They are, however, challenged to understand matters outside their immediate needs and positions. Even if they participate in religion, it is more mystery than belief. They are comfortable at festivals and sport; but discussions of current affairs and politics confuse them. They are apt to ignore the doings of the world. If someone should explain such things to them, it would be an intelligence check. Low intelligence creatures have access to the full range of weapons and the use of common implements without needing a check. Surprise in combat operates normally. How do you determine what counts as "an action or plan that the character would be unlikely to conceive?" Yes, that's the trick, isn't it? 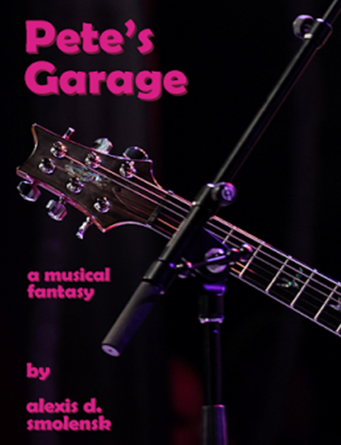 I'm working on a blog post that should go up within a few hours that partially addresses that question.